1. Mary Kay Cream Eye Color in "Violet Storm": Testing this cream eye shadow was actually my first time trying any cream shadow. I have always been hesitant to try one, due to the potential messiness of application. Although my experience with this eye shadow was quite fine, I can say that I definitely prefer using powder eye shadow, simply because it is easier to blend and work with. However, I have been enjoying wearing this underneath my lashes and smoking it out (alone, as a base, or with a powder eye shadow of similar color). Violet Storm is a very beautiful color, quite pigmented, blendable, and buildable; it lasts for many hours and still appears to be freshly applied. Once you apply this eye shadow, you have to start working with it right away, because it dries quickly. Overall, I would say this is a great cream eye shadow. What is your favorite cream eye shadow? 2. Mary Kay Cream Eye Color/Concealer Brush: I have not used this makeup brush for concealer application, because I much prefer using my fingers with my current concealer, as it gives a more natural, fresh appearance. However, I did use it to apply Mary Kay's cream eye shadow. Unfortunately, I found it difficult to blend the eye shadow; it is simply too stiff for my personal use. I love Mary Kay as a brand, so I am quite disappointed that this product didn't work out for me. 3. Mary Kay True Dimension Lipstick in "Pink Chérie (Satin)": Firstly, I love the sleek packaging of this lipstick—gorgeous on display. When I first opened it and saw the oh-so-bright pink color, I was worried that it might be too bright for my taste, as I am more of a neutral color girl. However, with a light hand, this color is quite buildable, ranging from a light to a very bright pink look. I am very pleased with this. This lipstick is moisturizing, yet comfortable to wear. 4. 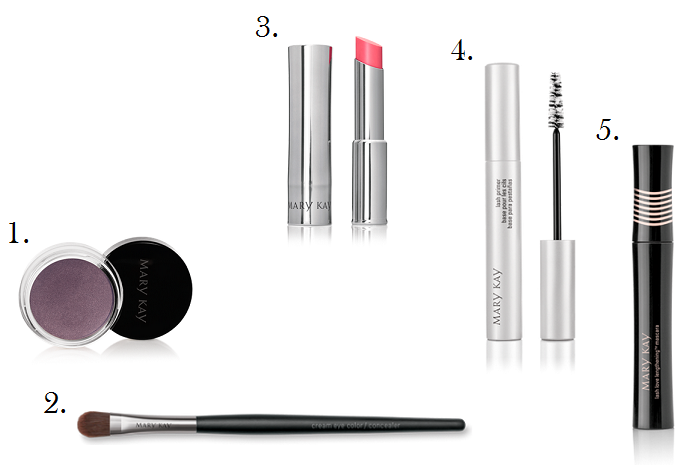 Mary Kay Lash Primer: This lash primer performs what it claims to do. It "intensifies lash volume, creates longer-looking lashes, lifts lashes, helps lashes stay curled longer, coats without flaking, removes effortlessly, and helps mascara wear longer." Job well done. 5. Mary Kay Lash Love Lengthening Mascara in "I ♡ Black": This is one of the best mascaras that I have tried. The most important thing that I look for in a mascara is that it does not clump on the brush upon removing it from its tube. This mascara does just that. It has a non-clumping, flake-free, long wearing formula. My favorite thing about this mascara is that it is formulated to condition and strengthen the lashes—a bonus. *Disclosure: Products complimentary from Influenster. See Valleyfash's disclosure policy for details. I love Mary Kay. Great reviews. It's definitely worth a purchase.